The opportunity to get out and explore the vast expanse of this beautiful Earth is one people take a hold of every day. For many, the transformative power of travel reaches far beyond a beautiful Instagram photo or a gap-year trip meant to quench your thirst for adventure and spontaneity. But more than that, travel can be difficult. Gathering inspiration, saving, budgeting, deciding when you should finally take advantage of those vacation days you’ve hoarded from work. It’s easy to get caught up in the stress and anxiety of actually booking a plane ticket and marking off the days on the calendar you’ll be out of town, globe-trotting. Fortunately, there are a few simple habits you can adopt which will have you ditching your fear of missing out for the adventure of a lifetime instead. Undoubtedly the most popular social media platform used my wanderlust-ridden millennials and everyone else in between, Instagram boasts a seriously considerable number of travel and adventure accounts which you can follow for daily inspiration. Often, many of these accounts offer information about unique, exotic and historical places anyone can visit if they have the time and a reasonable budget. You may find new destinations and trips to add to your bucket list, but you can also narrow down your search if you already have destinations in mind by using the search and geo-tag features Instagram offers to find posts particular to a specific location or search term. The platform allows you endless opportunity for discovering where you travels could take you, with endless inspiration to boot. Similarly, you can set up a Pinterest board or join a travel group (or two!) on Facebook to gain more inspiration and connect with individuals who have achieved their travel dreams just as you hope to. Forget sifting through boring travel catalogues; social media does the trick. Likely the most common piece of advice you’ll hear from others who have scraped together pennies for pounds when it comes to saving for travel is the age-old adage of “skip the morning coffee.” Though this is a helpful tip – you could, for example, save up to twenty dollars (if not more) each week by making coffee at home as opposed to hitting Starbucks each morning – you should also consider changing your spending habits when it comes to other frivolous expenditures. Try shopping at vintage shops or thrift stores if you’re in need of a new outfit, and use the self-care products and accessories you already own before splurging on unnecessary items. If you could easily ride a bike to work or walk to a bar nearby to meet friends for drinks, you could save a pretty penny on transportation and fuel costs. You may even consider getting rid of your phone’s monthly data plan, which can be quite pricey, especially for smartphone devices like iPhones. If you dine out often – something I’m sure many of us like to do regularly – consider scaling it back to once or twice a month, and cook dinner for friends at your place or suggest potluck get-togethers instead. If your friends and family know you’re saving to travel, they’ll likely be more than happy to support your modest entertainment budget. Perhaps the last place you’d look when working on a budget for your future travels, your bank account could be helping – or hindering – your efforts. Take the time to go through your account plans with your bank to see where you could avoid unnecessary overages and bank charges, then sign up for a more simple account plan instead – one that saves you money rather than running up ridiculous fees. Once you’ve evaluated your banking needs, talk to a representative about setting up automatic pay transfer; most banking institutions allow you to have a certain amount of money automatically put into a savings account whenever you receive direct-deposited funds. When I decided to start saving for my move to Europe five years ago, the first thing I did was set up a travel savings account where $400 of each paycheck was automatically transferred into the account. Not only do you automatically start saving money, but it will help you budget and set money aside as a nest-egg for your travel plans. A side-hustle is an endeavor which helps earn you money on the side whilst you continue to work at your “everyday job,” and you may be surprised at how lucrative a side-hustle could be when it comes to saving extra funds for travel. One of the easiest ways to start a side-hustle is to consider a talent you have, or something you’re good at, and figuring out a way to monetize it. Once you know what you can do or offer, find a platform on which to market and sell your goods or services. 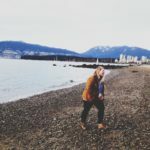 I paid for a two week trip to British Columbia out of pocket thanks to my side-hustle as a copywriter on Fiverr, where I was able to make $3,500 in three months without quitting my day job. If you have a product to sell, try creating an Etsy store and sell your goods on the digital marketplace. Yes, it’s extra work; if you’re willing to put the time and effort in, however, a side-hustle can actually pay off, and may just help you pay for that pricey plane ticket or offset last-minute accommodation costs. Budgeting may seem complicated at times, but it doesn’t have to be. With an entire world of budgeting apps at your disposal, it’s easy to find a phone or tablet app that can help you create budgets for virtually every aspect of your life, and stick to them. My personal favorite is Mint, which helps you budget, manage your funds and even keeps track of your credit, making budgeting a cinch. With or without an app, however, you may find it helpful to set a specific budget for each area of your life, such as food, entertainment, transportation and disposable income. Formulate budgets using an app, a notebook or advice from an accountant; whatever you have to do, ensure your budgets work for your lifestyle and are set up in such a way that you can save a few extra dollars without being unrealistic. If you’re just as sick as I am of lurking airline websites or hotel platforms for good deals and discounts, peak times for buying cheap plane tickets and travel vouchers, consider downloading an app which will track all of it for you. I use Hopper, which allows you to set a trip or destination, add in the dates or times you’d like to travel there, then tracks the costs for you, notifying you when the best times are to buy a ticket and letting you book your flight in the app. These apps let you rest easy and live your life without worrying about keeping watch of airlines and hotels like an overlord.